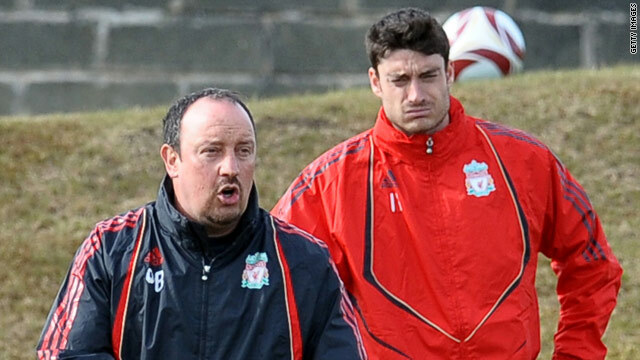 Liverpool coach Rafael Benitez (L) has come under fire from Spanish winger Albert Riera (R). (CNN) -- English Premier League side Liverpool are a "sinking ship" under current coach Rafael Benitez, according to one of their players. Albert Riera joined the Anfield club in September 2008 on a four-year deal but has been a peripheral figure this campaign. Liverpool finished second in the Premier League behind Manchester United last season but the 18-time title winners haven't won a trophy since 2006. The club are currently in sixth place, 15 points behind league leaders United, were knocked out of the European Champions League in the group stages and dumped out of the FA Cup by second tier side Reading. Now Riera has laid the blame at Benitez's door in an interview with Spanish radio station Marca: "When the coach says nothing to you and you are well, with no physical problems and training well, you cannot help but think it must be something personal. "If I'm doing something badly and you are my boss, and you value me, then you are going to come and tell me what I have to do to play again. This is what hurts me. When you see a ship is sinking and don't do anything. "It's a little frustrating because you see that you can help. I've been here two years and I know how he (Benitez) is. He's never sorted out a situation with a player by talking with him. He thinks he's in charge and everything else falls on deaf ears. His dialogue with the players is practically nil." His comments were later criticized by former Liverpool and Germany international Dietmar Hamann, who made 283 appearances for the club between 1999 and 2006. He thinks he's in charge and everything else falls on deaf ears. His dialogue with the players is practically nil. He suggested to the UK Press Association that Riera wasn't in the team because his form hasn't been up to scratch since joining from Espanyol. "I didn't read too much into the comments because he's a player who has not played too much football over the last six to eight months," Hamann said. "He is clearly frustrated but you have to say since he signed for Liverpool he has not done enough to really have an opinion on the manager. "If Riera is not in the team it is probably because he is not doing enough in training or in games. You have players these days who complain about managers and I think these players should look at themselves." Riera is concerned that his lack of first-team football will affect his chances of going to the World Cup with Spain, and he says he is considering offers from Russian clubs. He added on Marca Radio: "I would like to be here for the rest of my career, but players live to play. My objective is to go to the World Cup and for this I have to play. "Right now the only market open is the Russian one, I have offers from two teams and, looking at my situation, that has made me reflect a lot."